Sold by Cooleader Technology Co., Ltd. and Fulfilled by Amazon. Gift-wrap available. 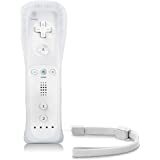 Bundle includes one motion plus remote and one wired nunchuk controller, fits for Wii and Wii U console very perfectly. 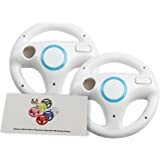 It cannot be used on PC or other game consoles Do not buy our product if the software version of your Wii below 5.7 or if your game console has been cracked. The remote controller combines the function of pointer, motion sensor, speaker and shock vibration together. Connect with the console via Bluetooth by simply pressing the SYNC button. Built-in motion sensor, accentuate your sense of touch while playing. Built-in motion plus to enhance the control. Powerful speaker provides instant audio feedback. Accessible to people of all ages and all abilities. Powered by 2 AA batteries (not included, and we recommend you to use rechargeable AA batteries to save money). Brand new with highest quality, 100% extremely strict test for all of our products before sold, bringing you with a relaxed game time. Third party product, not manufactured by Nintendo. CooleedTEK Online is the only legal owner of CooleedTEK. CooleedTEK takes full responsibility of all CooleedTEK products. Please kindly check the name of seller store in case of buying a fake and shoddy product. All of our products are 100% Brand New and Highest quality. 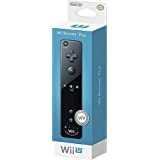 This item includes one remote + one wired Nunchuk for Wii and Wii U consoles perfectly. Equipped with silicone case and powered by 2 AA batteries (not included). 1. The remote controller has the function of pointer, motion sensor, speaker and shock vibration. Connect via Bluetooth with the console by simply pressing the SYNC button. 2. The wired Nunchuk has the function of motion sensor, thumb stick and triggers. Plug it into the remote when using. Power: powered by 2AA batteries (not included). Cable length of wired Nunchuk: appro 1m. 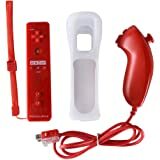 How to Pair the Wii Remote Controller with Wii Console? Step 1: Power on the Wii console. Step 2: Open the back cover of remote controller, then put into two new AA batteries. You will find a small red SYNC button beside the battery slot. Press SYNC button, FOUR lights (the Player LED) on the controller will flash. Step 3: Open the SD slot on the Wii console, you will find a red SYNC button next to the SD slot. Then press this SYNC button. Step 4: Wait for a few seconds, the Player LED on the controller will stop flashing and light up when paring is complete. The Player LED indicates the player number of the controller currently in use. Note: For Wii U console, please open the Wii U Menu and then Follow the on-screen instructions and press SYNC on the controller to finish the pairing procedure. Send us message if you have pairing problem. Works great. No complaints. My teenager has laid claim to it, lol. Easily distinguishable from the other controls since it's blue. Difficulty staying connected with initial setup but after repeated trys it locked on and has been connected now for 2 months-. Slower than original controller but after a while becomes un- noticeable. Got kids back to WII play. Sometimes these 3rd party controllers are sketchy. This one has so far been a solid purchase. 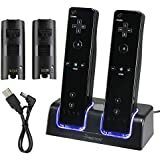 It doesn't feel cheap, it isn't overly light (usually a sign of cheap parts), and even had instructions on how to sync with the Wii - a first in my experience. Love the color and works great with the Wii System! This is a Wii controller alternative. For what it's worth it worked wonderfully. 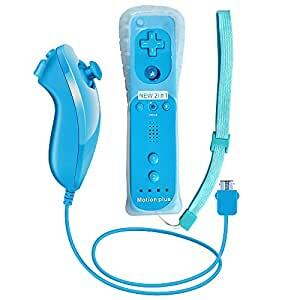 I was able to play all the Wii games i had with this. The protective case it came in was also a nice touch and i prefer using it as it gives you a better grip as it is made of silicon or similar material. 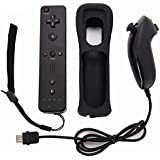 Good Wii controller for ~$20 or so.